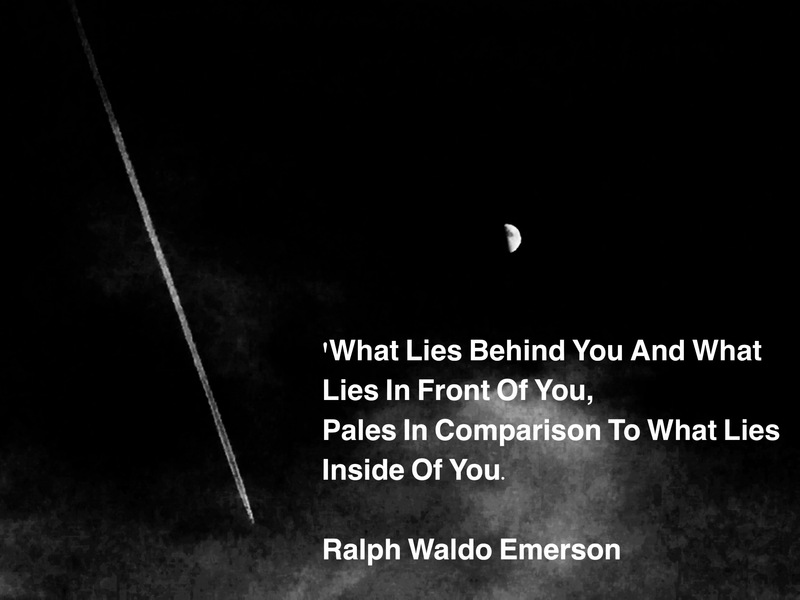 This week I drew inspiration from the philosopher Ralph Waldo Emerson. Looking back or looking forward is not a novel subject. Being asked to ‘focus on the now’, is even the new then. I can share my experiences, and say, that this is not easy. We all have one of those days, don’t we? Perhaps we are in a situation that seems disproportionate and unfair, and we feel sad and discouraged. During those moments we may tend to bring back all bad memories from past situations and victimize ourselves. We may blame the world for what happens to us. And we may block our capacity to act, focusing instead on feeding our sorrow. Instead, we may still blame the circumstances and everyone involved, but try to deny what has just happened. We may rush to get rid of the situation, by forcing ourselves to not talk, to not think, and to look forward, taking half-cooked decisions. We will look back and we will look forward, and act just as I described above. It is ok. As long as we are aware of it, and stop doing it. The best may be to feel a bit ‘miserable’, and live our pain, because not doing it, at least for me, translates into neck pain or headache, which are clear signs of tension. Then if I hear of someone else’s problem, and if that is worse than my trivial ones, this may help to put my perceptions into the right proportion. But as one of my best friends told me once, it is not fair to ourselves to compare our issues with others’, in terms of worse or better, as every person has a different story, deserving attention and respect. Nevertheless, what I have learnt in my attempts to not get stuck in the past, nor flying to denial, is exactly what this quote says. When in trouble, we forget that within us lies always the potential to find strength. Although everyone possesses that, we are mostly unaware, almost blind, to the power that lives inside us. Great teachers and philosophers remind us that we hold within ourselves the capacity to create the life and world we truly wish. Our challenges may remain but the way we look at it can change. Our attitude changes if we take the lead for our own destiny, instead of assuming the role of victim of outer circumstances. Whilst navigating through life’s time zones of ‘past, present and future’, I search for my internal strengths, but not always succeed to remember that when in the ‘eye of my own hurricanes’. That’s when I get inspiration from people, who found the internal switch to activate their power. I have a story to share with you, of one of those special people. Here is the story of Susana Schnarndorf, a beloved friend of mine. Ten years ago, Susana Schnarndorf, a 37-year-old Brazilian, female, divorced, former triathlon athlete, and six-time Ironman winner, mother of three children, discovered that she had a rare and incurable degenerative disease. MSA, Multiple System Atrophy, is an illness that causes multiple system degeneration – such as muscle rigidity – including vital organs as lungs and heart. Her first prognosis: a 2-year survival rate. After a severe depression, Susana saw a light at the end of the tunnel. She needed to stop thinking of the disease. She started swimming again and decided to compete by joining the Brazilian Swimming Paralympic Team – she found a new meaning for life. Susana participated in the 2012 Paralympic games in London and secured a 4th place in her category. She also won the 100m breaststroke S6 class at the World Championship in Montreal in 2013. Besides that, she brought home the most coveted trophy. She was elected by popular vote in her country, as the best female athlete of the year in Paralympic sport in 2013. Susana now holds a World Record and is a golden medal promise for 2016 Paralympics. That is her big dream too: Paralympic Golden Medal in The 2016 Paralympics in Brazil. She had to make the most difficult decision of her life. She had to let her kids go and live with her ex-husband, as she could not take care of them alone. According to her, “I’m not healthy anymore, but I found peace after losing everything. Before it all, I was just paying attention to what I didn’t have but now, I just focus on what I do have. I am now conscious that people choose unhappiness. I chose happiness”. Where does she find so much strength? I recently watched a documentary about her life. She finds life in the love for her children. And that keeps her going. It is because of them that she swims. It is for them that she wins. And it is through them that she recovers the life that the disease tries to take from her. And all she wants is to enjoy each minute she can have with them, cherishing each day, every birthday, and each time she can still hug them, with immense emotion. She hopes that when she is not here anymore, she will leave her fight for life, as a good lesson for their own lives. Having a bad day, is not an option anymore for Susana. Her life suddenly transformed into what could have been considered, not one, but a series of bad days. Not for Susana. Here are two videos about her life story. The first is in English and the second in the Portuguese language. Even if you don’t know the language, you may want to watch it. 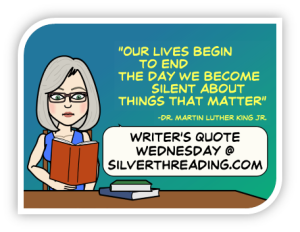 This quote goes to the Writer’s Quote Wednesday Event from Colleen at Silver Threading. If you are an aspiring writer, that is the place to make reflections, learn and get many tips and valuable information about writing. If you love quotes, every week you should check her blog. Clap,Clap,Clap! Wonderful post and quote, dear Lucile! Thank you for sharing this inspiring story…Susana is an amazing person not ever giving up but making the most of her situation and choosing happiness. I sincerely believe people either chose to be unhappy or chose to be a happy loving person. Your friend Susana is an extraordinary example of how our minds can affect our bodies and our lives..with the choice of happiness over sadness, she has created an amazing life for herself and for those who she inspires! Thank you for sharing her story with us as well as those thoughts and emotions that you feel. Your quote comes at a perfect time for me…and really impacts me! Thank you my friend! Powerful image and quote. And your friend sounds like a strong and determined woman who has done something wonderful with what she’s been given. Thank you for sharing this story x. Thank you for this powerful post, and for sharing Suzanna’s story. What an honour to be female athlete of the year in the Paralympic sport. A friend of mine has a very similar story as he deals with Multiple Sclerosis. A triathlete, just a few years younger than myself, he started the local triathlete club. And yeah, if he does not train, it does progress faster. He has had this diagnosis for a lot of years. Although no longer able to compete, his gruelling exercise program which does include running, cycling and swimming has helped a lot to live a relatively normal life. Your post brought tears to my eyes. What a powerfully strong woman your friend is to make the choice to be happy and positive in light of her circumstances. What a role model for others! Thank you for sharing her story. You are lucky to have her as a friend. She sounds simply amazing. I’m sorry to make your eyes teary. Thanks for your heartwarming comment. I indeed feel blessed to be her friend. And I’m hoping she wins a medal in 2016 Paralympics games. I do hope it helped you keep your beautiful smile on your beautiful face. Have a lovely weekend.